Sadly, ‘Gannet - From the Cockpit No.7’ by Simon Askins, provides no insight into the bird itself, so we have to content ourselves with the aircraft - the last such produced by Fairey Aviation. 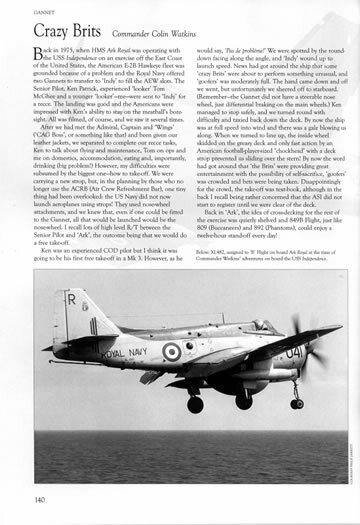 As well as being an experienced Gannet pilot, author Commander Simon Askins (retired) went on to become a Maintenance Test Pilot, giving him superior insight into both the operational and technical aspects of this aircraft and indeed, all of the Royal Navy's fixed-wing types of the period. In doing this, the he is ably assisted (as usual) by a knowledgeable and similarly experienced cadre of fellow pilots, observers and Flying Tel's, who recount the vagaries, risks and satisfactions felt whilst operating the Gannet, from prototype and AS.1 to AEW.3. As is now familiar with this 'From The Cockpit' series, the book (the largest so far, at 152 pages) is divided into several, logical, chapters. Following those on 'Introduction' and 'Requirement', chapter three deals with 'Development and Production', including interesting pieces on the introduction of the Gannet to the Indonesian Navy, illustrated in part, with colour photographs. Continuing, with chapters on the 'Powerplant' and 'From The Cockpit', the main meat of the book is wrapped up with those on 'Weapons, Stores and Capabilities' and on 'Maintenance'. The latter half of the book moves on to look at actually operating the aircraft, divided into four chapters: 'Gannet Training' (flying trials units and 'work-up' squadron flying units); 'Front Line Squadrons' (including the insight of an exchange USN Lieutenant-Commander); 'Royal Naval Volunteer Reserve' (a short sojourn with the Gannet before such units were abolished) and 'Other Gannet Units' (including the A&AEE Boscombe Down and the Empire Test Pilots School Farnborough). Needless to say (though I have often said it anyway), it is the photographs in this excellent series of publications, which put them in another class altogether. There are some 200 photographs packed into these pages, including 19 in colour, providing fantastic detail and information. 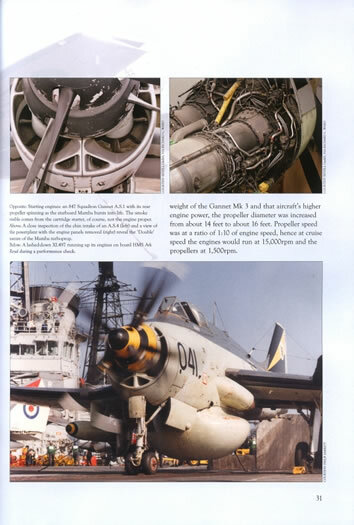 Also, once again, there are the usual colour artwork profiles by Roger Chesneau (29 in total, over four pages) covering various service aircraft and variants, including a two-page, 4-view, spread of Gannet AEW Mk 3 'XP199', as flow by the author with 849 Naval Air Squadron at RNAS Brawdy, in May 1966. As I write this, I am looking at a slide I have just recently scanned, of Gannet AEW Mk.3 'XL500', which I photographed at the Yeovilton Air Day on 3 September 1977. Hindsight is a wonderful thing, but apart from thinking, 'why didn't I take more (and better!) pictures?' and 'is it really that long ago!? ', it is the knowledge that only a few years later, it was the lack of such aircraft in the Falklands conflict that nearly was our undoing, which strikes me most. 'Gannet From the Cockpit No.7', undoubtedly maintains the high standards of this series. Text and images combine, to give a fantastic account of a true naval workhorse, covering tasks from anti-submarine, COD (Carrier Onboard Delivery), electronic countermeasures and airborne early warning. 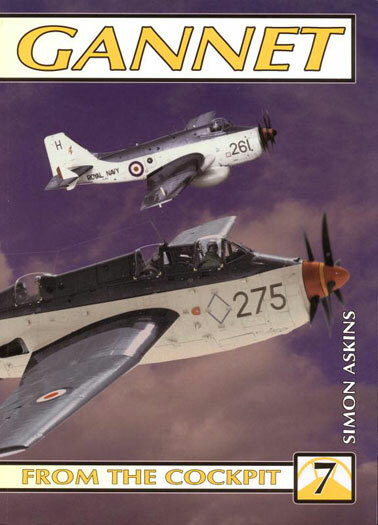 From a personal perspective, I learnt a lot about the Gannet through reading this book. This includes such interesting snippets as; the AS/COD variants had a variable incidence tailplane (linked to the flaps) to cause the nose to rise up more when landing, that the Gannet could also suffer from the same propeller 'discing' problem which afflicted the Wyvern, that the second Mamba engine could also be started by 'windmilling' its propeller in the slipstream of the first, and that those scalloped depressions in the bomb bay doors of the AS variants are to allow the wheels to be retracted even if those same doors remain stuck open. Overall, this is another excellent title from Ad Hoc which should certainly provide enough information and detail for any modellers weighed down with recent kits from several manufacturers, in both 1:72 and 1:48 scales. (1) Monty Python aficionados will forever remember of course, that they (Gannets) 'wet their nests', but that is another story and vinyl LP (see "Bookshop" sketch, on side two of the 'Contractual Obligation Album', 1980).